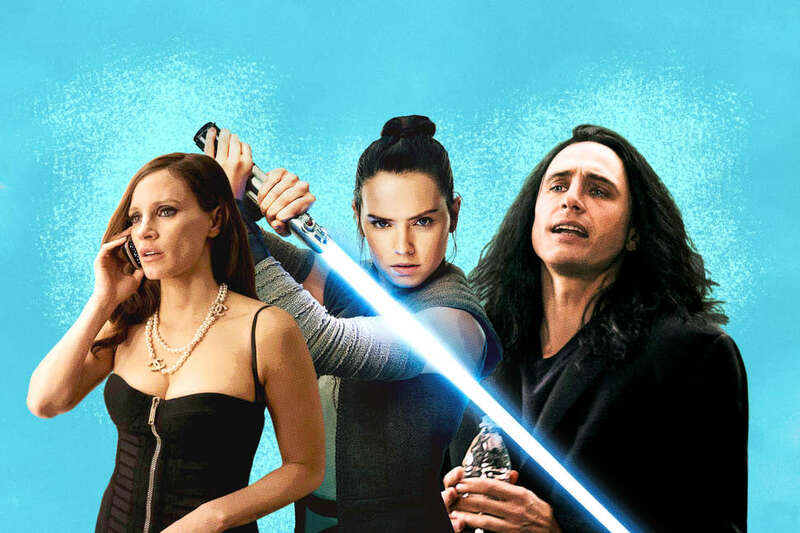 What new movies are coming out this Thanksgiving? This Christmas? On those rare, short days when you don't have to attend a family function and can make it to the theater? Hollywood's fully stocked movie release schedule waits for no one. As you catch up on blockbusters and Oscar contenders from the past year, a new wave of movies is ready to vie for your attention. Some of them should be worth your time. Here are the 2017 movies you'll want to make room for between now and the holiday season. Reason to be excited: The latest from Pixar is a celebration of the vibrant, musical traditions of the Mexican holiday Día de Muertos. Twelve-year-old Miguel idolizes musicians and dreams of making a life out of his guitar. One problems: his parents ban music in the house. 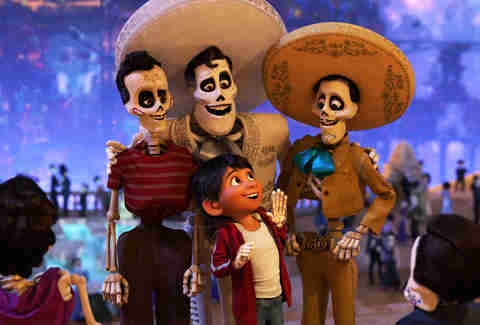 The familial push and pull lands Miguel in the world of the undead, and in the hands of Toy Story 3 director Lee Unkrich, his adventure should be one of the more wondrous adventures of the holiday season. 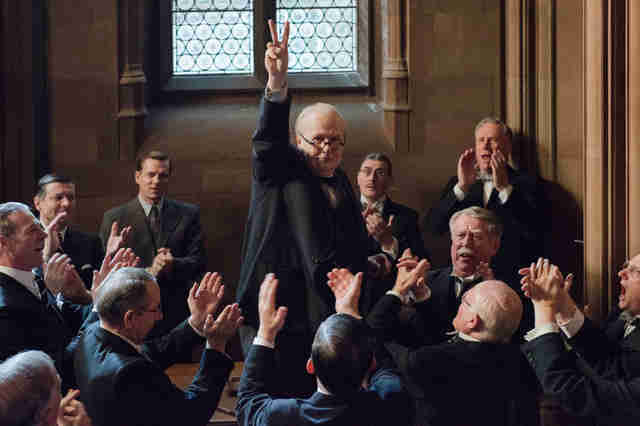 Reason to be excited: Through layers of latex and gruff, Gary Oldman transformed him into authoritative British leader Winston Churchill to chronicle the pins-and-needles moment in world history when Hitler's invasion looked like an unstoppable force. Joe Wright (Atonement) directs this historical drama, which pits a war-embracing Churchill against political adversaries and the looming Nazi invasion, a portrait that should be equal parts psychological and physical. Reason to be excited: One of our favorites from this year's Sundance Film Festival, Call Me By Your Name stars Homeland's Timothée Chalamet as Elio, a teenager coasting through summer at his archaeologist parents' villa in Italy. When a hunky grad student named Oliver (Armie Hammer) takes up study-abroad residence, Elio awakens, melts, and entangles in a passionate romance he hesitates to broadcast. A Bigger Splash director Luca Guadagnino is a master of lush and flavorful stories that feel like mini, drama-filled vacations. Call Me by Your Name might just be his masterpiece. Reason to be excited: There are no half-measures with Tommy Wiseau, the failed actor/secret millionaire behind the notoriously awful The Room, and there are no half-measures in The Disaster Artist, James Franco's dramatic telling of the cult movie's bizarre backstory. Franco goes full Daniel Day-Lewis to become Wiseau, who latched onto his young, acting classmate Greg Sestero (Dave Franco) and drove them both to the hell of inert, overproduced, melodrama-making. While Franco's shtick is hilarious, the arc of the movie is jaw-dropping, and even a little tragic. "YOU ARE TEARING ME APART, LISA!" has never felt so... terrifying. Reason to be excited: No moviemaker working today can mix an adoration for classic genre cinema with the electrifying emotions of modern storytelling quite like Pan's Labyrinth, Pacific Rim, and Crimson Peak's Guillermo del Toro. His latest is a love story with a fishy twist; when the janitor at an experimental government facility (Sally Hawkins) meets the lab's prized possession, a merman straight out of the Black Lagoon, she becomes enraptured and determined to break him out of captivity. After seeing the movie at the Toronto Film Festival earlier this year, we declare The Shape of Water to be one of the most gorgeous films in years. Reason to be excited: Tonya Harding was an athlete who pushed back against socioeconomic norms to transcend the competition as an ice skating Olympian. Jeff Gillooly was her allegedly abusive ex-husband. Driven by competition -- or something more deranged? -- they conspired to break fellow ice skater Nancy Kerrigan's leg before 1994 Winter Olympics in Lillehammer. 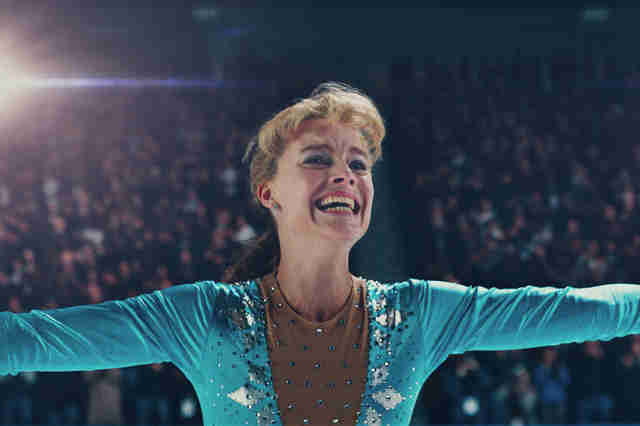 With an unhinged temperament and some authentic skating, I, Tonya tries to get in their heads. Reason to be excited: In a galaxy far, far away, the battle between the Resistance, led by General Leia Organa, and the First Order, under the supervision of Supreme Leader Snoke and his Force-wielding lackey Kylo Ren, rages on. 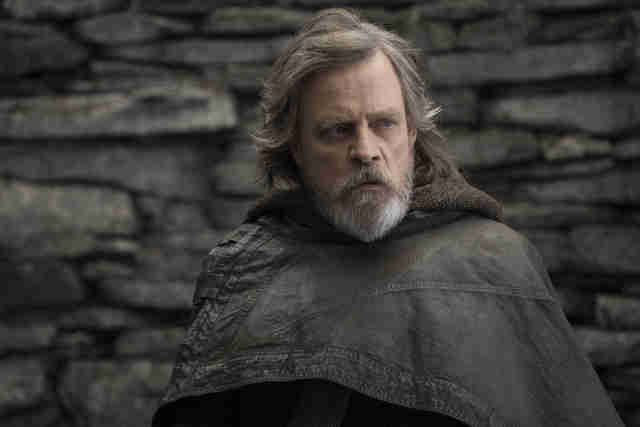 But in the final seconds of 2015's The Force Awakens, Rey was on the outskirts of the conflict, meeting an old master who could change the balance of good and evil forever: Luke Skywalker. But will it be that easy? In this second installment -- clocking in at two-and-a-half-hours, the longest Star Wars movie to date -- director Rian Johnson is expected to redefine what it means to be a Jedi in this crazy universe. 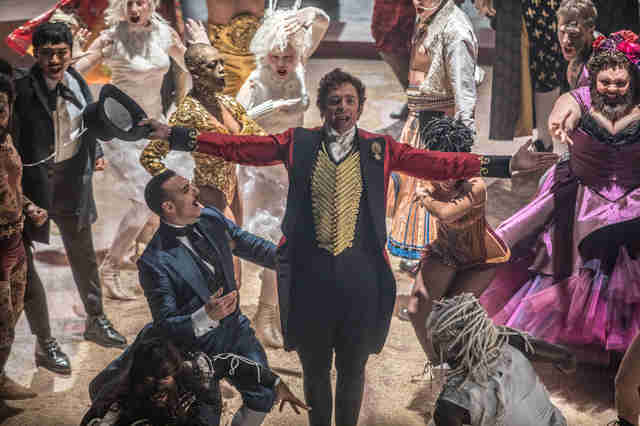 Reason to be excited: With original music from the songwriters behind La La Land and the hit Broadway musical Dear Evan Hansen, this original movie musical stars Hugh Jackman as P. T. Barnum, and imagines the origin story of Barnum & Bailey Circus as a showstopper-filled romp. It should be abundently clear if you have the heart for this movie, in which Zac Efron and Zendaya sing a duet called "Rewrite the Stars." Reason to be excited: Out of college and out of jobs, the Barden Bellas reunite to sing their hearts out on a European tour. It's amazing that the franchise no one saw coming is back for a third round of pop-covering a capella (and unless a new generation of singers steps in, it might be the last round), but Pitch Perfect 3 should serve fans exactly what they want this holiday season: an aca-scuse to gather the sisterhood and hit some high notes. 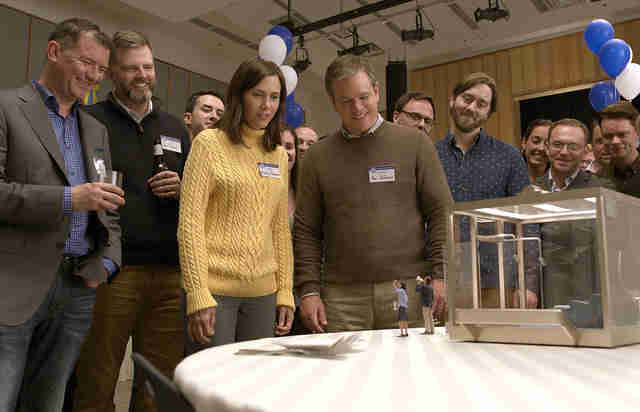 Reason to be excited: Director Alexander Payne and longtime collaborator Jim Taylor (Sideways , Election) reunited for this biting satire about a version of the future where, to combat overpopulation, citizens of the world opt to shrink down to 5 inches tall. Matt Damon stars as a down-on-his-luck occupational therapist at an Omaha Steaks butchery who undergoes the process to turn his life around. But the procedure leaves him with major existential questions, explored with wit and droll soothsaying by Payne. The movie is bitterly funny, but we'll bet you'll have a tear in your eye by the end. Reason to be excited: Will Smith's first Netflix movie is the size of your typical blockbuster and demands recognition on a list of theatrical offerings. In the fantasy crime thriller, Smith stars as a copy who partners up with... an orc. Yes, like the ones from Lord of the Rings. The world of Bright is brimming with magical creatures and ancient prophecies but looks like Training Day (which, not coincidentally, director David Ayer wrote). 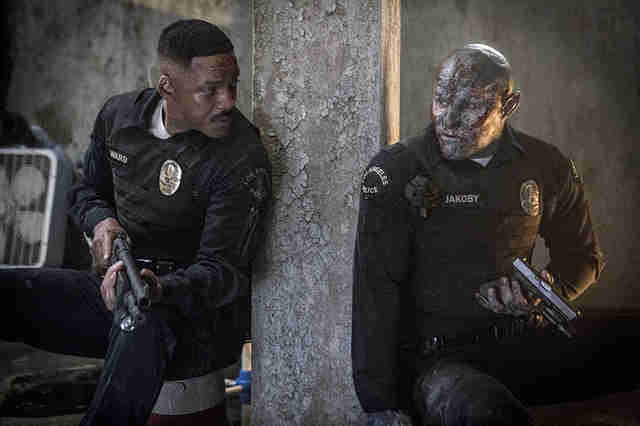 Whether it's a hit or a bomb, Bright stands out as one of the more interesting gambles of the year. Reason to be excited: Steven Spielberg. Tom Hanks. Meryl Streep. 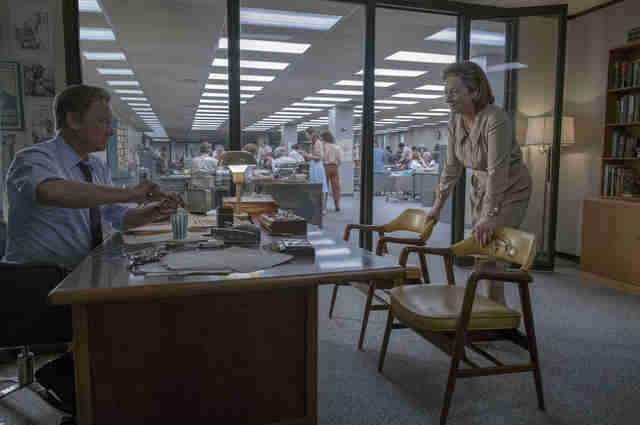 The holiday's most star-studded drama enacts the tik tok of how The Washington Post, with caution and integrity, eventually leaked the Pentagon Papers, the Vietnam War documents that would eventually lead to the Watergate scandal and President Nixon's resignation. If a war between journalists and the government feels familiar, well, you're probably on to something there. Reason to be excited: This Western is already your dad's favorite movie of the year. The year is 1892 and an Army captain (Christian Bale) is assigned to return a former Native American enemy (Wes Studi) back to his people. From Black Mass director Scott Cooper, the movie has a bit of The Searchers blood pumping through its brooding veins; during his mission, the captain encounters a woman (Gone Girl's Rosamund Pike) who lost her entire family to a vicious Indian attack, who lights up the existing friction between the white man and the Native American. 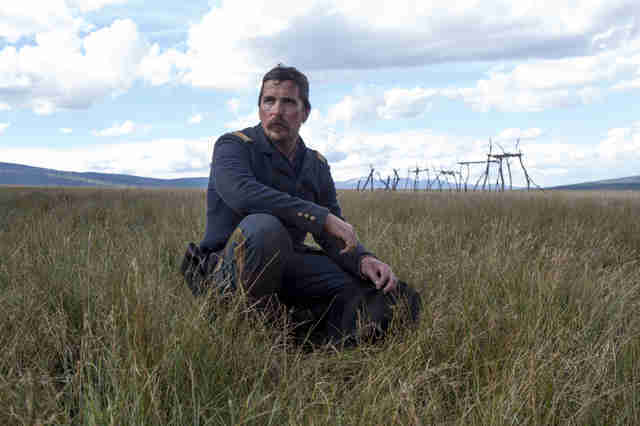 Bleak and germane, Hostiles is no Dances With Wolves. Reason to be excited: West Wing and The Social Network writer Aaron Sorkin makes his directorial debut telling the true story of Molly Bloom, a Colorado belle who oversaw one of the highest-stakes underground poker rings in history. Jessica Chastain fills Molly's shoes, delivering her usual tour-de-force work with the added ammunition of Sorkin dialogue. Reason to be excited: Described in whispers as an artful Fifty Shades, this succulent drama from Paul Thomas Anderson (There Will Be Blood, Boogie Nights) stars three-time Oscar-winner Daniel Day-Lewis as a renowned, British dressmaker with a passion for fleeting relationships. But when Alma (Luxembourgian actress Vicky Krieps) steps into his life, romance, sexual fire, and the purity of his craft are disrupted. Can a genius survive love? That may be the first of many questions Anderson poses in his lush new film.